The concept of Peacekeeping has been held by Canadians to be a source of pride. And it was Lester Pearson, while Minister of Foreign Affairs who brought the idea forward to solve the sticky problem of Britain and France trying to oppose the nationalization of the Suez Canal by Egypt. The Suez Crisis put in motion a concept that still is held as a way to avoid more catastrophic conflicts by putting a third party between the opposing forces. In the time of Pearson, it was Canada, that acted as the honest broker while the French, British, Egyptians and Israelis – all under pressure from the United States – solved there ‘differences’. The concept was that the parties would not seek further trouble by taking on the peacekeepers. And for the peacekeepers part, at least at Suez, they were of sufficient military strength provide a presence that could not be easily ignored. That isn’t to say that various sides haven’t tested that principle. The idea that peacekeeping is somehow a safe and benevolent practice has also been tested and found wanting. 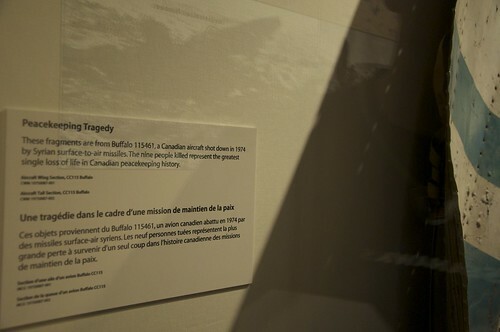 In 1974 a Canadian transport airplane carrying nine passengers (5) and crew(4). The de Haviland Buffalo #461 (s/n 115461) had been assigned to carry Canadian peacekeepers to Damascus, Syria. This was part of the UN peacekeeping mission that followed the Yom Kippur War in October 1973. On August 9 after being cleared to land in Syria it was hit by 3 Syrian Surface to Air Missles which destroyed the aircraft killing all aboard. This remains the largest single loss of Canadian peacekeepers. 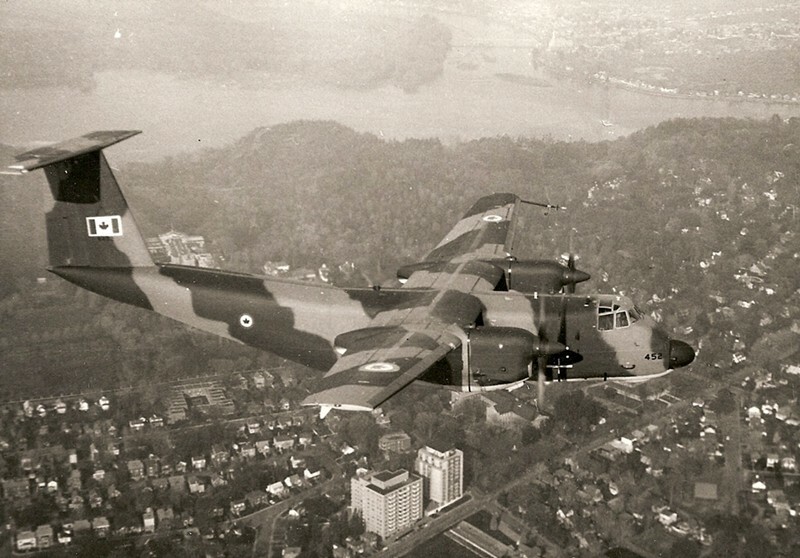 A restored aircraft has been painted as Buffalo 461 by the Canadian Warplane Heritage in Hamilton. 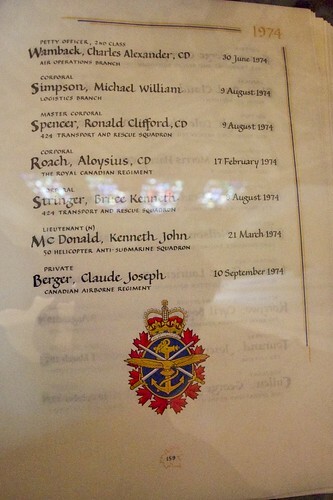 The names of all the peacekeepers killed are recorded in the Book of Remembrance which is on display in the Peace Tower on Parliament Hill in Ottawa. On the day I visited it was open to the page from 1974 showing the crew of Buffalo 461. In 2008, August 9th was designated National Peacekeepers’ Day, now you know why. Serendipity and The People you meet …. It has been my experience that the universe is resplendent with irony and serendipity. Sort of two sides of the same coin really. On the last day of 2009, I expressed gratitude for the lucky circumstances of the prior year. As if to reinforce my thoughts of the prior day, I met some folks on the first day of this year that only made me more grateful. I’ve always believed that you make your own way in life but you needed to recognize that your accomplishments are never solely because of your own effort. If you forget the latter part of that the universe has a couple ways to remind you. Irony tends to focus on the negative or annoying side of things. Serendipity provides for the more positive reinforcement of your actions. If I was to track my affinity for faith in the ebb and flow of the universe, it would likely go back to my early twenties. I was flying a group of air cadets at Boundary Bay airport. The weather was getting increasingly bad and I just had one of those feelings that it was time to put the airplane back on the ground. There was much disappointment and, all things being equal, I would have felt like an idiot for a good, long time but Serendipity stepped in. As I remember it, that night on TV there was a story of two other pilots in a Mooney who crashed into an area of south Surrey known as Panorama Ridge. This is not intended as a story about making the right choice but rather about being confident in the choices you make – right or wrong. Learned to have confidence in my own decision making and always trusted those little feelings every day after that. Fast forward to last Friday (Jan 1), a unique Canadian tradition is the New Year’s Levee. When various levels of government open their doors to the general public to welcome the new year. I attended the Levee at my local Municipal Hall. A minor thing, expected to go in shakes some hands, have a cup of coffee and be out in less than and hour. But then Serendipity comes in again …. At the end of the receiving line there is a gentleman in a white shirt helping out with the food service. An older gentleman to be sure, like semi-retired. He was having a conversation with someone else and I found it interesting enough to join them. Turns out he had served with the Black Watch of Canada. A storied Canadian Regiment known for there heroic but devistating attack on Verrières Ridge during the battle of Normandy in 1944. In a breif conversation I learned he has a son in the Navy, and a grandson in the PPCLI due for deployment to Afghanistan in the next couple months. This unique little piece of Canadian history had just dropped into my lap. I couldn’t end the conversation without offering my hand out of respect and offering my best wishes for the safe return of his grandson from his upcoming duty. The Princess Pat’s are as fine a unit as you will find so that young solider is in good company but the thoughts of their recent loss in an IED blast couldn’t be far from that Grandfather’s mind. Had it ended there, it would have been a nice anecdote to share. However it didn’t. While standing and having a conversation another unlikely story unfolded. Another older gentleman joined that circle. He was Polish by birth, had been interned in Russia after the fall of Poland in 1940. Interned is probably a little to polite. Russian prisons under Stalin didn’t show a lot of compassion to anyone. He survived the conditions long enough to see Russia join the war against Germany at which time he was allowed to leave to join the Polish Forces in England. He was a paratrooper and mentioned he had jumped in combat twice once in France and once in Holland. Well my sense of history was again peaked. There was only one major airborne operation in Holland and the Polish connection sealed the deal. My response was “You jumped at Arnhem?” – he did. If you don’t know the story of Operation Market Garden , I’d recommend the book or movie “A Bridge Too Far” as a primer. Again a story of valour and horrible loss. Now I don’t expect this to mean as much to others as it would to me. I find history, especially military history compelling. Serendipity had placed these two stories in front of me in the most unassuming way. All it does it reinforce the value of putting yourself out there and being open to the experiences that arise around you. But the story doesn’t quite end there. I found myself out at lunch today just randomly wandering deciding where you grab a coffee. Whether it was serendipity alone or a unconscious sense of something else. I found myself standing by the side of a street in downtown Victoria shortly after noon as the procession carrying the body of another PPCLI soldier passed by. I paid my respect to Lt Nuttal and went on my way.